After I got the flowers placed I added the leaves. Which, by the way are not the exact size. The are smaller than the rubber image. So now you know that I really don't have that great of an eye for the size!!! I told you it was just luck! Once I got the leaves on and put behind the flowers (Ctrl and the arrow down key takes care of putting the pieces behind the flower, it moves it to the back). I did pick a color (Old Olive) for the leaves before I added them all. But as for the flowers I didn't add the color to them until I was all done. I didn't want to have to be moving them around to get the colors to where they were pleasing to the eye. It's not really a big deal but I didn't feel like moving each leaf every time I moved a flower. I've done that before and realized that if I had added the color of my flowers first after they were placed where I wanted them, then add the leaves. SO much less stuff to move around. And I did have to move a few flowers even after I had all the leaves and colors in. I just wasn't happy where they were at. Once I was happy with it I printed it out and this is what I got. I could have printed out a second one and cut out some flowers but after spending the time I did on the digital part I didn't want to spend much more time on this card. The words on the card are from the "All Holidays" set. I think the swirls on the wording enhanced the look of the card. I added some pearls to the center of the flowers and layered it on top of a half sheet (folded in half) of Old Olive. 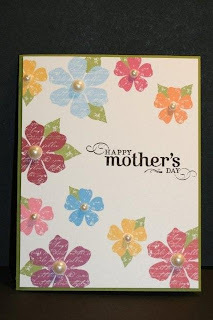 Ok, I added it to the Old Olive card stock first and then added the pearls. I've done it the other way and it's pretty difficult to add tape to the back of the card without causing warping or even folds. Now I just need to add a trimmed piece of white card stock to the inside and it's ready to sign and give to mom on Sunday!!! Happy Together Thinking of You Card.